We manufacture high quality Sliding Tracked and Sliding Cantilever Gates and a range of Swing Gates that ensure your site security is maintained. 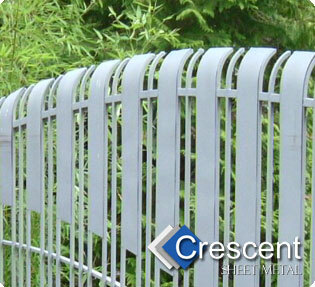 Our industrial and commercial gates are manufactured with vertical round or square bar. Hollow bar and anti climb welded mesh is available to meet your specific requirements. Gates can be finished primed, galvanised or powder coated. All of our gates can be automated with comprehensive access control and safety features in conjunction with our partner CES electrical who are specialists in industrial and commercial access control and loading bay systems. Stainless Steel mailboxes are available to suit you gate installation and Crescent are specialists in manufacturing housing and enclosures for access control stands, photo cell posts etc. A comprehensive range of industrial and commercial standard fencing is available to complete the physical security of your site. At Crescent we offer a bespoke manufacturing and installation service at competitive rates.